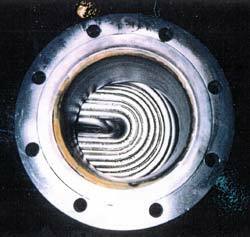 Most heat exchanger studies begin with a given flow rate and temperature change. A certain amount of heat must be taken out of a flow of material or put into it per unit of time. This is the load. Using common terms, we measure heat in BTU or British Thermal Units, and we express heat transfer rate on an hourly basis. Then, load - termed q in the following equations - is expressed in BTU/hr. In heat exchanger design two flows of materials are involved - one in the tubes and one on the shell side surrounding the tubes - we assume that all the heat given up by one material goes into the other material. It does not matter which flow of material we use to measure load if that assumption is made. If either fluid vaporizes or is condensed from a vapor in the heat exchanging operation, then temperature differences alone do not account for the load. A large amount of heat - usually the greatest part of it - will be latent heat used or given up during this change of state.